It’s easy to become a member of the Cannon Beach Arts Association, and support a variety of activities that enhance and support the arts in Cannon Beach. Your annual membership helps to support all of the programs of the CBAA. Our members are one of our most important assets and to thank them we offer the following benefits of membership in the Cannon Beach Arts Association. The CBAA is a 501c(3) nonprofit organization and your donation is tax deductible. We are seeking art lovers willing to sponsor a monthly exhibit with partial or full financial gifts. Our goal is to raise $1000 in sponsorship for each show. The CBAA is a 501(c)3 not-for-profit organization; your patronage is 100% tax deductible. 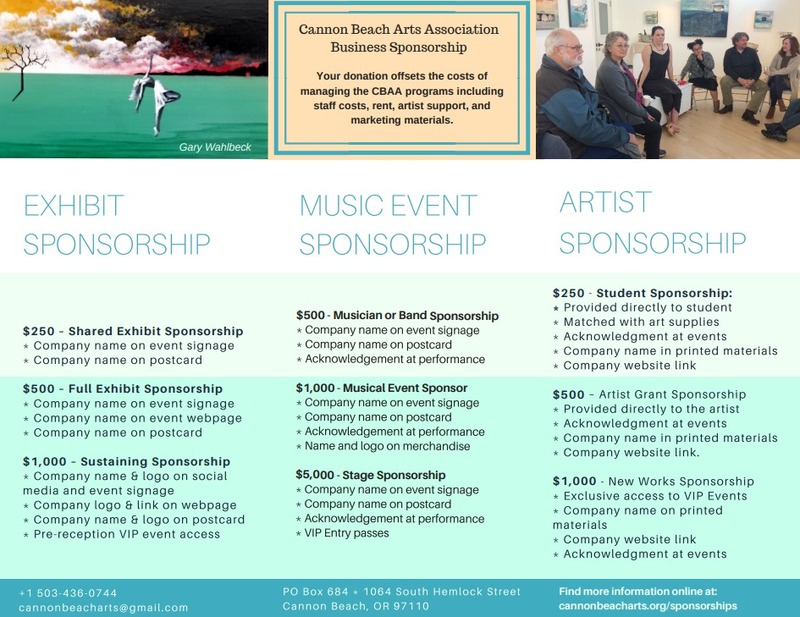 The brochure below outlines the various ways your business can support the arts in Cannon Beach.